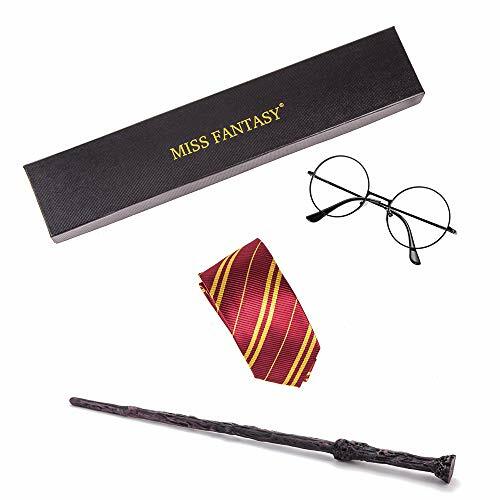 MISS FANTASY Tie Cosplay Party Costume Accessory Halloween Party (Wand Set) | What Should I Say? This tie is perfect for cosplay dress up party,costume party,Halloween party,Christmas party,birthday,do also great for daily use. NOT ONE-TIME UES.The necktie is made of high quality smooth fabric,very well made,you can wear it anytime except at party time. DIY tie,size is L57xW2.5'',adult size,you can cut into your child's size. This necktie is perfect gift for your friends also. 100% Free risk purchase,30 days no quibble guarantee. If you have any questions about this product by MISS FANTASY, contact us by completing and submitting the form below. If you are looking for a specif part number, please include it with your message.